We’re exhibiting at the Farm Business Innovation Show on the 7th & 8th November 2018 at the NEC, Birmingham. The show is free to attend and you can register for your free ticket on http://bit.ly/2A1DFda. Visitors can choose from 200 free inspiring and insightful seminars including leading sector case studies and top industry role models who have made ground-breaking business decisions when diversifying their land. 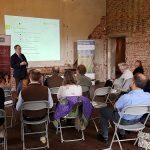 Visitors also have the opportunity to meet 500 handpicked suppliers who aim to provide any rural business with new and innovative methods of developing their land. Bean Beanland, our leading low-carbon energy consultant, is speaking in Theatre 4 at 2pm on Thursday 8th November with Hugh Taylor from Roadnight Taylor. Bean and Hugh will be talking about opportunities for Heat, Cooling, Power & Energy Storage in a post-subsidy environment. We’ll be at stand 3080 so come and see us to discuss the optimisation of the use of land assets with respect to heat and discuss investment and funding mechanisms which might be available to you.